Motul Pirelli Suzuki’s Matt Moss has inched closer to the 2013 Monster Energy MX Nationals MX1 title with his second consecutive round win at Echo Valley in Toowoomba, Queensland. Moss claimed the overall after qualifying second in Go Pro Super Pole, winning the first moto and then scoring second in the final 30-minute moto of the round. For Moss he now has a 25-point lead in the championship heading into Coolum’s season finale next Sunday. Runner-up for the weekend was rookie Kirk Gibbs (Motorex KTM), who starred with a runaway second moto victory in gruelling conditions. Earlier, he finished second behind Moss in the first moto after leading much of it. Completing the podium was Gibbs’ teammate Todd Waters, who faces a tough task if he’s to challenge Moss for the title next weekend, but remains certain he can step up when it counts. 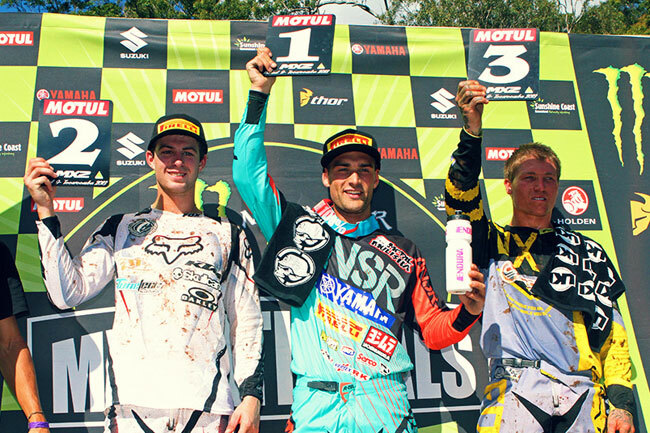 Waters was third in moto one, but a frustrating crash forced him to settle for second in the final moto of the round. Fourth was Jake Moss (Campbell Mining Suzuki) with a pair of hard-fought fourths, while CDR Yamaha’s Super Pole winner Billy Mackenzie was fifth. Mackenzie was fifth in moto one, but he too crashed in the second while on a charge and had to settle for a lowly seventh. His teammate Lawson Bopping was forced out with Glandular Fever discovered during the week. 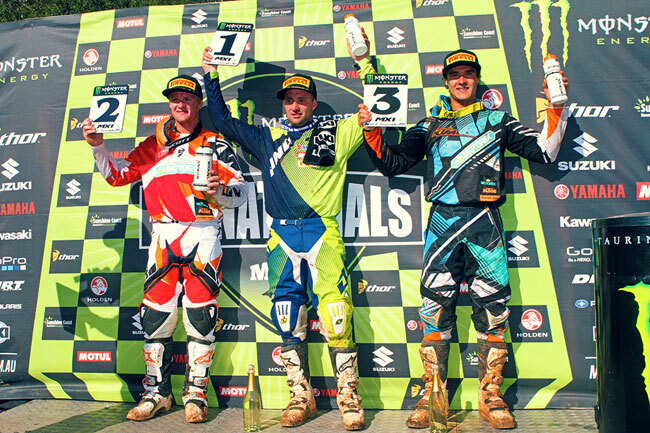 Moss, Kirk Gibbs and Todd Waters filled the MX1 podium. Image: Simon Makker/Makkreative.com. Monster Energy Kawasaki’s Adam Monea was sixth, finishing eighth in moto one before rebounding to a solid third in the second. Teammate Jay Marmont was close behind in seventh after the pair did battle throughout the round, trailing with 7-5 results. Completing the top 10 overall was Cody Cooper (Motul Pirelli Suzuki, 6-10), Gareth Swanepoel (Carlton Dry Honda Racing, 9-8) and Same Martin (DPH Motorsport Suzuki, 11-9). In the Motul MX2 ranks it was Serco Yamaha’s Luke Styke who clinched his maiden professional title with a perfect 1-1 performance aboard the YZ250F. Styke wrapped up the title with an epic moto one win, stalking arch-rival Kale Makeham (Tune Tech Racing KTM) until the closing stages before making a move stick and sealing the series. In moto two, debuting the number one plate, Styke was simply in a class of his own from the outset, streaking away for an unchallenged moto win. He hasn’t lost a second moto all season. Luke Styke clinched the title for Serco Yamaha and debuted the number one plate in moto two. Image: Simon Makker/Makkreative.com. Makeham was content with second for the weekend, his confidence growing each and every moto as he races to battle Styke at the front. His day finished with 2-2 results. Completing the podium was another 250 SX two-stroke in Brock Winston (Choice Motorsports KTM). The Queenslander was fourth in moto one and almost runner-up in the second, before Makeham demoted him to third late in the moto. Still, he was satisfied with his second overall podium in a row. KTM privateer Dylan Long was fourth overall for the weekend with an impressive 3-4 scorecard, continuing his late-season surge on the SX-F.
Former national champion Ryan Marmont (Raceline Pirelli Suzuki) finished fifth with 8-5 finishes. He edged out Yamaha privateer Beau Ralston’s 7-6 results, while Kayne Lamont (Choice Motorsports KTM) was also tied on 49 points with 6-7. Hard luck story of the round was Takeshi Katsuya in 12th, the Honda rider finishing fifth in moto one and then forced to pit in the second while running behind Styke. He ended up 19th. Styke, Kale Makeham and Brock Winston made up the MX2 rostrum. Image: Simon Makker/Makkreative.com. The Pirelli MXD ranks was topped by GYTR Yamaha’s Jay Wilson, who was second in moto one before overcoming the two-stroke horsepower in moto two for the race and round wins. It was another standout season second-half result for Wilson, proving that he can battle with the best in the category on a 250F. Kiwi Hamish Harwood (CMR Red Bull KTM) stretched out his advantage in the series, claiming second overall via 1-2 finishes and now taking an 53-point lead into Coolum ahead of Wilson, who’s jumped to second. 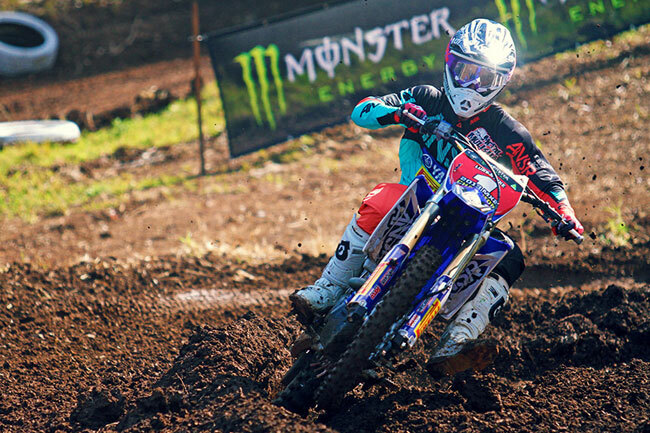 Completing the podium was impressive NSW-based Yamaha privateer Corey James aboard a YZ250, scoring a pair of thirds during the motos in Toowoomba. Kawasaki rider Jesse Dobson was fourth with 8-4, ahead of returning Yamaha rider Jake Emanuelli who was fifth in moto one and eighth in the second. 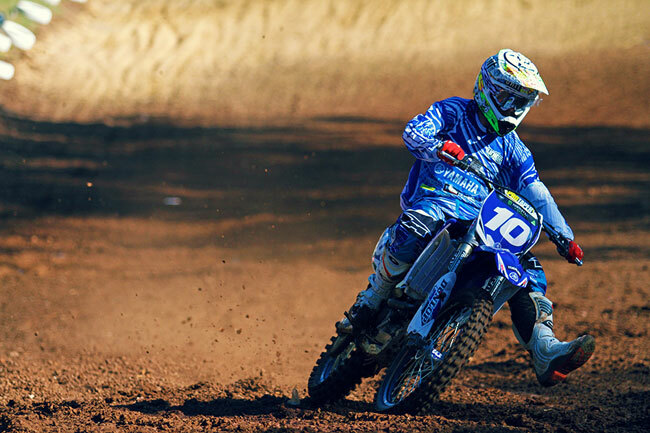 Victory in the MXD ranks elevated GYTR Yamaha’s Jay Wilson to second in the series. Image: Simon Makker/Makkreative.com. The Monster Energy MX Nationals will conclude at Coolum on the Sunshine Coast next weekend on 31 August-1 September. Top photo: Motul Pirelli Suzuki’s Matt Moss on his way to the MX1 win. Image: Simon Makker/Makkreative.com.